Unfortunately, the dress you are looking for (Style: AS-A8465d79E69, Name: AS-A8465d79E69) is no longer available. Lovely by design, this casual high-low floral-print party dress is blooming with beautiful detail. Sage green provides a delicate light back-splash for feminine botanical patterns on this short casual dress. The soft crepe fabric enhances this dainty appeal, fashioning a modest v-neckline with buttons that extend to the hemline. A smocked waist cinches the midline to create shape while allowing the fabric to drape gracefully in the bodice and skirt. Sending attention to the legs and allowing for effortless movement, the high-low skirt with a ruffled-trim hemline complements the style of the dainty cap sleeves. 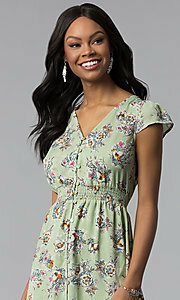 Under $50, this green floral-print party dress is definitely a charming look for less. Front 54" Back 45", Hollow to Hem Front 40"